SpaceX's Dragon spacecraft approaches close to the International Space Station in this view from the station's robotic arm camera on Oct. 10, 2012. The Dragon capsule is flying the first commercial cargo mission to the station for NASA. SpaceX's robotic Dragon cargo ship is slated to arrive at the International Space Station early this morning (Oct. 10) for a nearly three-week stay. The Dragon spacecraft has been chasing down the huge orbiting lab since launching Sunday night (Oct. 7) atop SpaceX's Falcon 9 rocket. If all goes according to plan, the unmanned capsule will approach the station in a series of cautious steps early today, then finally be snagged by its huge robotic arm at 7:17 a.m. EDT (1117 GMT). NASA will broadcast the action live on NASA TV and online. You can watch the Dragon docking webcast live here beginning at 4 a.m. EDT (0800 GMT). If it passes all of these trials, NASA astronaut Sunita Williams and Japanese spaceflyer Akihiko Hoshide will grapple the capsule using the station's 58-foot (18 meters) robotic arm. They'll guide Dragon to the Earth-facing side of the orbiting lab's Harmony module, where it will be bolted in place for an 18-day stay. 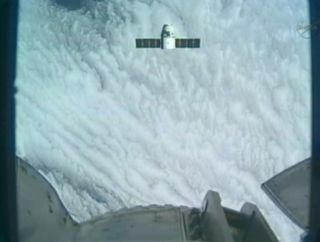 Dragon is embarked on the first-ever bona fide cargo mission to the space station by a private vehicle. It's carrying 1,000 pounds (454 kilograms) of supplies and scientific experiments, and it will return to Earth on Oct. 28 with a different load of gear totaling about 2,000 pounds (907 kg). Dragon's mission is the first of 12 unmanned supply runs California-based SpaceX will make to the station under a $1.6 billion contract with NASA. The space agency also inked a $1.9 billion deal with Virginia-based Orbital Sciences Corp. to fly eight cargo missions with its Antares rocket and Cygnus spacecraft. The Dragon capsule has visited the station once before. This past May, it became the first private vehicle ever to dock with the 430-ton orbiting complex on a historic demonstration mission intended to show that SpaceX was ready to begin making its contracted flights. Orbital Sciences, for its part, plans to test-fly the Antares rocket for the first time later this year. With its venerable space shuttle fleet now retired, NASA is looking to private American vehicles to fly both cargo and crew to low-Earth orbit. The space agency hopes at least two different commercial spaceships are ready to carry crew by 2017; until then, the nation will be dependent on Russian Soyuz spacecraft to ferry its astronauts to the space station and back. Dragon could be one of NASA's astronaut taxis as well as a cargo craft. SpaceX is upgrading the capsule to carry crew, and the company is one of four firms that have received NASA funding over the past two years to develop manned spacecraft.